As part of growing up, children learn how to interact and play with each other on the playground. However, there comes a time when learning becomes more important and prevalent in youth, and less time is spent on the playground, while more time is spent in the classroom. I feel that there needs to be more places where children can still interact with each other in a playground atmosphere, but learn and be educated at the same time. This would create happiness and well-being. 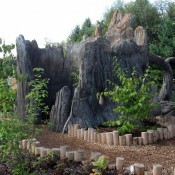 One place that encompasses my belief is the Childhood’s Gate children’s garden at the Penn State Arboretum. Here there are structural features, art, and special elements that enrich the learning environment for younger kids, all taking place in this uniquely designed garden. 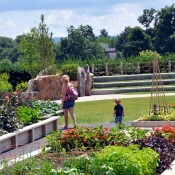 Central Valley introduces visitors to historical patterns of land use by featuring a child-scale prairie; huts made of woven willow that simulate a Susquehannock encampment; and contemporary vegetable garden beds, along with a greenhouse. An old-fashioned farm pump invites children to learn how to draw water from a well. A small amphitheater and Aspen Story Circle offer venues for presentations, musical performances, and more. Limestone Cave features a colony of bronze bat sculptures, and even a secret passageway. In this playful space, children can explore important features of our limestone valleys. Elements such as an elevated sinkhole through which water falls into the Limestone Cave also provides occasions for important science lessons. 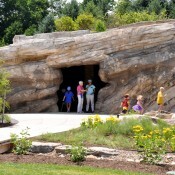 At the fossil gap, children learn about the plants and animals that lived in Pennsylvania hundreds of millions of years ago and can identify key developments in the evolution of plants. The sculptures create circular spaces intended for both group and individual reading. 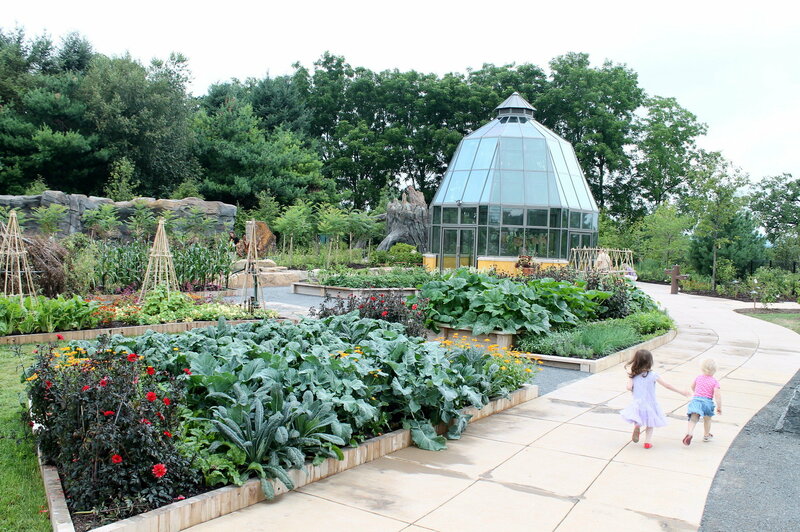 The glass house is surrounded by vegetable gardens and is a space for children to engage in cultivation. A sod-roofed tool shed, hand pumps, and space to make scarecrows, plant seedlings, carve pumpkins, and harvest flowers and vegetables is provided. 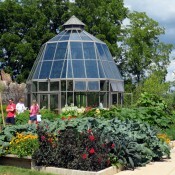 The glass house includes books and workstations for creating community engagement. 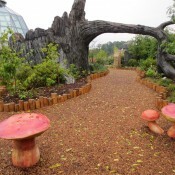 Mushroom hollow is one of the most interesting pieces of the garden because it is actually used by adults. The University’s leaders in the fields of forestry and mycology have helped to guide the design of this space, which recreates the woodland environment of the mountains surrounding Nittany Valley. Visitors can explore the trees, mushrooms, sitting and art spaces here, and learn about the intensive research done by Penn Stater’s. 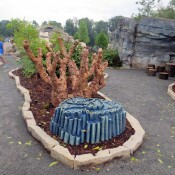 The tree stumps are taken from our native forest so it is really cool! Lastly, in the mushroom hollow there is the discovery tree. The hollowed-out stump is a discovery space inviting children to explore its interior. Attached to the inside wall is a musical instrument, and children can peek outside through several holes in the sides. Extending out from the tree is a large root, under which visitors can pass. There is also a sound tube, and a sun dial nearby. This promotes a interesting learning space. These spaces make up a very small portion of the 400 acre restoration site we call the Arboretum. 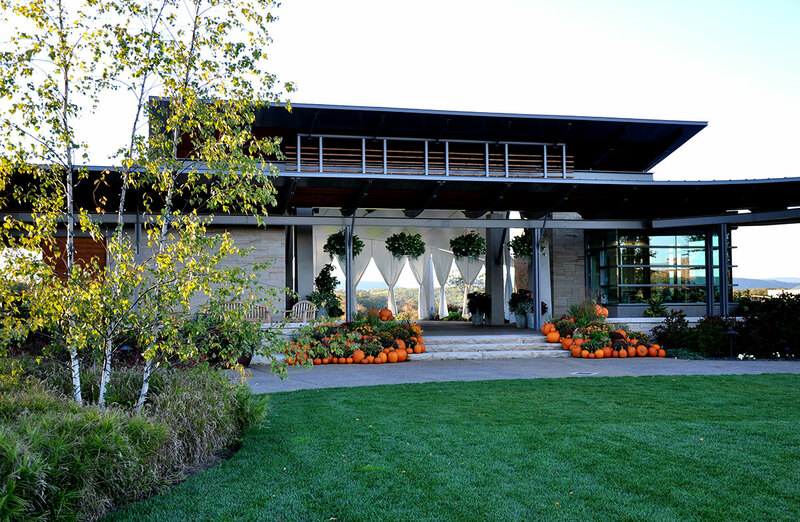 The arboretum’s mission is to design a safe and sustainable environment that promotes learning, relaxing, and peace. Students at the school come to walk through the botanic gardens to have picnics on the event lawn, watch the sunset, or just to pass sometime between there classes. Placemaking is seen here as it inspires older and younger students, creates potential for plant preservation, and is a public space that promote people’s happiness and well being. Hopefully some of these cool features allow you to see just how humans can interact with with public spaces in a unique way.